When I was younger, probably around fourteen or fifteen, my favorite thing to do was shop for beauty, haircare, + skincare products. Yes, even then. No matter where my mom needed to stop, I was always trying to talk her into buying me a pretty lipstick, a new shampoo that was out, or even a pack of hair ties - basically, I wanted anything I could get my hands on! I can remember standing in the aisle, twisting the tops of off Pantene Shampoo's + Conditioner's just enough to get a quick whiff of the newest, latest and greatest scents. Fast forward a little over 10 years and I'm still that girl. (However, I probably washed my hair more back then than I do now. #sorrynotsorry) Since I only wash my hair a couple times a week, I always need a product that will really lather and make my hair feel insanely clean. I've tried numerous brands - expensive and inexpensive, different formulas, and must-have brands, but I always end up back with my OG - Pantene. Not to mention, you can't beat the price point. 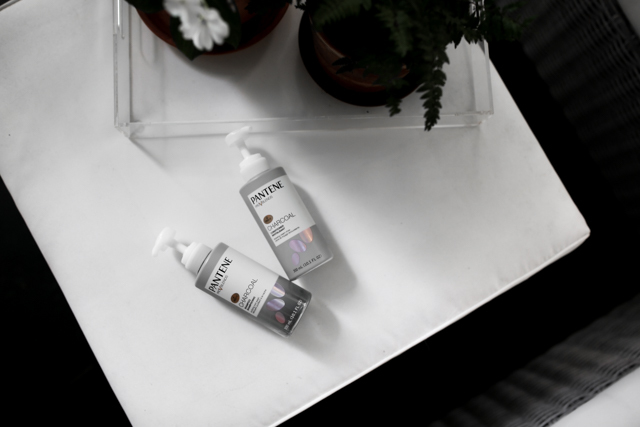 When Pantene reached out and asked me to try/review their new Charcoal Collection, it was a no brainer. The Charcoal Collection is intentionally made for people like myself - fewer washes, yet purifying every single time. The Pro-V blend of B5 and antioxidants purifies the root while activated charcoal cleanses the hair + scalp to remove dirt and impurities. After washing + Charcoal Conditioner, my hair feels so refreshed and renewed. It's easy to brush through and because it's so pure, it doesn't leave any unwanted residue behind. Also, I love the easy pumps on the bottles - having hands free bottles in the shower is so convenient! Currently in stores and online at Target, purchased two of the Pantene Charcoal Collection products and receive a $5 gift card! OOOOH this looks so interested! I've never used charcoal hair care products but love charcoal for my skin!